I have been a singer since I was nine months old. I became a songwriter at the age of 23 when no song, however passionately I interpreted it, seemed to express adequately my own particular view of the world. I became immersed in the writing of rounds and harmony at the age of 40 when I was asked to teach music for a women's prayer service at one of the first Jewish women's conferences ever organized (back in the early 1980's in San Francisco). Looking through the literature I found nothing that would give expression to the blending of diverse experiences particular to these women - some of them rediscovering their Jewish roots for the first time. As I taught my new rounds and songs I saw how singing in harmony could have major impact on how we experience ourselves in relation to others and I also saw how melody and harmony could help deepen one's understanding of text. In this autobiographical sketch I will tell you about that as I trace for you my career as singer, cantor, songwriter, choral conductor and arranger. I will also talk about the intellectual, political and spiritual components of writing and singing in harmony. I was nine years old when I joined the Yeshiva Rabbi Moses Soloveichik choir. We had the good fortune to sing under Seymour Silbermintz, a noted arranger and conductor of the time. I graduated from there to the High School of Music and Art, the hippest school in New York, where as an unstylish daughter of refugees I was rather out of place. I immersed myself in the music and went from singing "Torah torah..." to the Italian aria "Caro Mio Bien" in less than a year. I sang the requisite number of Masses and requiems (Mozart, Handel, Bach, Verdi, etc.) with the New York All-City High School Chorus under Peter Wilhousky until I discovered the Jewish Zamir Chorale of New York under the direction of Stanley Sperber. I traveled with Zamir to Israel in 1967 and sang with them on Mount Scopus and at the liberated Wailing Wall, and continued singing with Zamir until I moved out to California in 1970, where I joined the San Francisco Symphony Chorus under Seiji Ozawa as well as the Oakland Symphony Chorus, which had different rehearsal nights. I also spent many years at Labor Zionist Youth (Habonim) movement camps. This was probably the best thing my parents could have done for me - it took my Judaism out of old-world shtetl Poland and brought it into contemporary America and Israel. Suddenly the prophets that I had studied in 4th grade were made relevant to me - it was their voices that inspired my own social activism and that of my fellow Habonim campers in that era of civil rights and anti -Vietnam war work. Along with the music of the American working class, we sang the songs of the early Israeli pioneers - the chalutzim - and these became basic to my growing repertoire that formed my Jewish and social consciousness. When I went off to Israel in the 60's to Kibbutz Urim and to the Hebrew University of Jerusalem, I steeped myself in the songs of the contemporary poets like Naomi Shemer and Ehud Manor. In my twenties I let my hair grow long and sang in coffee houses about noblemen hanging by golden chains, of losing husbands down Welsh coal mines or drowning off the coast of Greenland. Ultimately I felt compelled by reality to write some of my own songs and this began an era of naive renditions of loves found and lost. These eventually gave way to songs of protest as I became active in the 1980's in the anti-nuclear and Central American movements. Throughout college, I taught music in Sunday schools and performed at Hadassah and Hillel functions and I continue to do so here in California. I was developing a split personality. One that sang the beautiful nostalgic songs of Israel, the other that sang peace songs at protest rallies. While still a passionate Zionist, I felt that some of my criticisms of Israel would not be welcome at the Jewish gatherings I was invited to sing in, and at the same time I felt that many of the organizers in the peace movement - most of them secular unaffiliated Jews (who had in some way forgotten their connection to their roots and their past) were not interested in my love of Israel and the need to ensure her survival. It wasn't till I connected with the women's and feminist movement that a slow integration began. Jewish feminism, with its insistence on and permission of an honest expression of one's deepest self without shame or inhibition, helped me integrate my political and Jewish roots and at last feel empowered to do something about having been relegated to the balcony in all those early years. It helped me reassert an identity that was neither the international working class nor the cliched victim of real or imagined love affairs. The first such song that emerged from this consciousness was a song that I wrote about Ruth and Naomi. Ruth is the Moabite women who grew close to Naomi and decided to adopt her Jewish mother-in-law's land and religion and follow her back to Canaan. She became the great grandmother to King David (who is said to be the progenitor of the Messianic line.) Using both traditional text and my own interpretive lyrics it became a song about women's tenderness, and the sacredness of our connections, about welcoming the stranger and our commitment to tikun olam. I arranged it for viola, guitar and voice, so that musically it combined my classical training with my folk song roots and my earliest chazzanish influences. 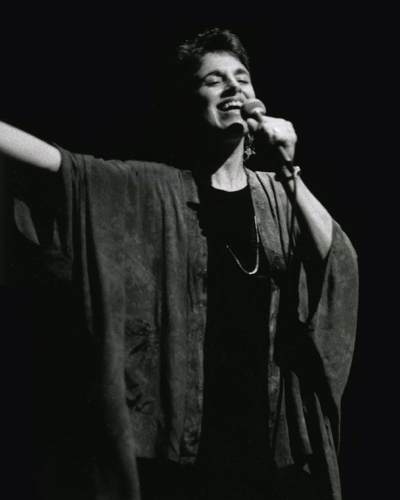 It was this song that made me determined to sing in Hebrew to all my audiences, Jewish and non-Jewish alike, and convinced me that it was time to bring social concerns back into my Jewish world - the concerns that had been so deeply ingrained in me by my years in the labor Zionist movement. Using traditional Hebrew and original English texts, my music became my contribution to midrash at a time when more and more women were reclaiming, rediscovering, recreating and inventing midrash, liturgy, dances, poems and songs to add onto the vast wealth of Jewish texts. As I wrote my songs, childhood influences re-emerged. Years of choral singing meant that I rarely heard melody lines by themselves. Years of studying Talmud in Yeshiva also meant that I rarely took a text at face value. I found the endless disputations over the smallest words and vowels poetic - like the slight variation in a musical meter that can make a song utterly exciting. My goal was to put them together; the richness, depth and complexities of harmonies were to elucidate the richness, depth and complexity of text and give it new meaning. I wanted to give the listener a multi-dimensional understanding of text that could not be gotten from a linear reading off a page in a book. For instance, I set to music a strange and interesting text by the philosopher Hillel, called "Marbeh". ("The more meat, the more worms; the more money, the more worry; the more Torah, the more life; the more study, the more peace; and the more counsel, the more understanding.") So the text is about balance, and I wrote it as a three-part canon in which I create a kind of lyrical dialogue: "more money" is not only paired against "more worry" but is also heard along with "more tsedakah"; and "more study" is heard along with "more life", etc., so that you get a sense how interconnected all these concepts are - the music makes the meaning three-dimensional in a way that can't necessarily be discerned off the page. There are other ways that music contributes to our understanding of text. The repeated use of a drone will give emphasis to a particular line of text almost subliminally. A counterpoint (or countermelody) might suggest another view on that same text. Sometimes changing chords on a word allows one to feel the reverberations of that word in deeper places, and if it goes from a major key to a minor key or vice versa, this too can affect the emotional and intellectual understanding of the words being sung. The construct of a melodic line will affect the emotional impact of a song. For example, my chant for the "El nah Rfah nah lah" - this prayer coming from Moses begging for Miriam's complete recovery - is a cry and a plea to God, so I had the second phrase reach higher then the first with the please - the begging part being the highest note of all, then descending down into a chant that is repeated over and over, gathering momentum. Beyond the personal understanding of text, singing together creates a natural forum whereby strangers can be brought together. In June of 1995 I was privileged to travel to Kiev with Project Kesher and form the first International Jewish Women's Chorus. Seventy five women from all over the world, of differing class, lifestyle and experience, sang together. Our common language was the music, and the music became the basis of our community. The Torah portion Vayakhel - the word Vayakhel comes from the word kehilla meaning community - speaks about the men and women of wise and generous hearts who are asked to contribute to the building of the Mishkan - the holy sanctuary. If we look at the mishkan as not only a physical place but also the entire body of knowledge that is Judaism, then we realize that the Mishkan is not only composed of the physical elements that go into its building and maintenance but also everything we put inside, the readings and writings, and commentary, the songs and dances, and it is all this that sustains our community and has done so throughout the generations and around the world. And as we continue to make our contributions, so our community is enriched and our Mishkan is kept vibrant and holy. Writing and singing and teaching music is how I am trying to answer the call of Vayakhel. Writing songs that require others to sing with me means that I can't live in isolation; that I need a community of people around me to sing the songs. Singing in harmony is a paradigm for how we might respect differences while coming together to create a greater whole. It emphasizes both the strength of the individual voice to hold its own while recognizing that the whole sounds only as good as the individual parts. It's about blending and listening and helping others without losing your own voice. Where there is a weak voice in the community, everyone needs to figure out how to strengthen it, or else the whole community suffers. That is the ideal of community living, where each person does the the thing they do best and yet works in harmony with everyone else to the betterment of the community. And it is how we live together in the Mishkan. So I have to agree with that great cultural icon of our times, Marge Simpson, who is having an argument with Homer, who says "Singing is the lowest form of communication," and her response to him is: "Homey, you're wrong, this whole town runs on a song!" Writing songs - melody, harmony and words - is also one of the deepest ways that I connect with my own sense of spirituality. Heschel tells us that it is an essential component of the human spirit to do and experience wonder - to revel in creation and to participate in it. The discovery of new textures of voices weaving in and out of each other keeps my sense of wonder alive. A lyric deepens my understanding of the world and my existence in it. Songwriting is a gift that I feel I stumble upon because I keep myself open to it. I often feel like someone is writing through me and the words that come out of my mouth are as surprising to me as they might be to an eventual listener. It's like having my own revelation taking place on a regular basis. Writing songs and or arranging with others adds yet another whole level of engagement. It means connection with others at the point of chaos - in this case with the members of Vocolot as well as with my colleague Fran Avni with whom I collaborated on the Book of Blessings recording - it involves a tremendous level of trust and vulnerability out of which the created work that emerges is better than anything I might have written alone. It has been said that singing a prayer is like saying it twice. Perhaps writing the music for a prayer is like saying it four times. What a blessing I have been given to be able to do so! I do not take it for granted. What makes a good song? Often when we discuss contemporary Jewish music we ask: is it Jewish enough? Does it sound too much like American pop? How true to form is it? Perhaps these are not the right questions, but rather one should ask: Does the music truly convey the intention of the words? Is there a real understanding not only about the meaning of each word but also its context? Particularly when we are talking about T'fillah. Does the feeling of the music match the content of the prayer and does it flow from the previous prayer to the prayer afterwards? Is there an appreciation for the shape and size and sound of the word itself? All words have their own innate rhythms and melodies. (They can have many of them.) Do the words feel forced into the rhythm and melody? Do they feel disparate? A truly beautiful song makes the melody and words feel like an organic whole even as it integrates and is influenced by the overtones and rhythms of a surrounding culture. In Heschel's essay "The Vocation of the Cantor", he talks about music as the soul of language, how the music must not distort or contradict the meaning of a word but enhance and glorify it. A word has a soul, and we must learn how to attain insight into it's life. Songs should give wings to our prayers, songs should give color to our grief and joy, songs should express the depths of our greatest yearnings. May your lives be ever full of song. Amen. Selah.